Purple mattress is a fairly new product in the market that is already making a name for itself in the competitive mattress industry. It has been around for a short time and its first sales were made in January 2016. Here is my unbiased purple mattress reviews which are in accordance to the mattress users satisfaction and complaints. The top layer which is made of polymer. This layer is made using a unique Purple design, smart grid, to keep the sleeping surface cool and comfortable. The middle layer is made from polyurethane. It works with the top layer to create compression and transitional support. The bottom layer is made of polyurethane too. It is the layer that acts like the mattress foundation.The purple mattress has a soft, stretchy and breathable cover made from a blend of polyester and viscose. The white cover has a diamond pattern on the top and Purple’s logo on its sides which gives it an appealing and sharp look. The mattress shipping, which is free, is currently being delayed by about 2 weeks mainly because of the high demand. The mattress has a free trial period of 100 days and comes with a 10 years warranty. Long term durability information about this mattress is scarce since its quite new but going by the specs of comparable mattresses, it could last for more than 6 years. Purple mattress have a great support that enables it to reduce pressure points and conform to the body’s curves. The top layer uniformly distributes pressure between the body and the mattress. Whether you are a stomach, back or side sleeper, you feel your spine is well supported while you sleep. The mattress has a cool sleeping surface which is created by the effect of air pockets that are designed on the top layer of the mattress. It’s definitely one of the coolest mattresses available in the market. The mattress provides moderate resistance to movement ensuring that you neither sink nor get enveloped by it during sleep. Purple mattress prevents disturbance to the other person laying beside you when you move. This is because motion is only experienced in the areas adjacent to the movements thus isolating it to the one doing the moving. The mattress has a medium firm feel which can be rated 6 on a scale of 10. The firmness which varies with a person’s body size and type provides a pressure relieving feel. The mattress offers a rounded contour, that is similar to latex, by displacing your body weight. The responsiveness of a purple mattress is quicker than that of latex. The polymer in the mattress provides an excellent bounce. When pressure is applied to the top layer, it suddenly bounces back to its original shape. Customers report that the customer service at Purple mattress is above average and they try to minimize the wait time by phone as well as answer all your questions. 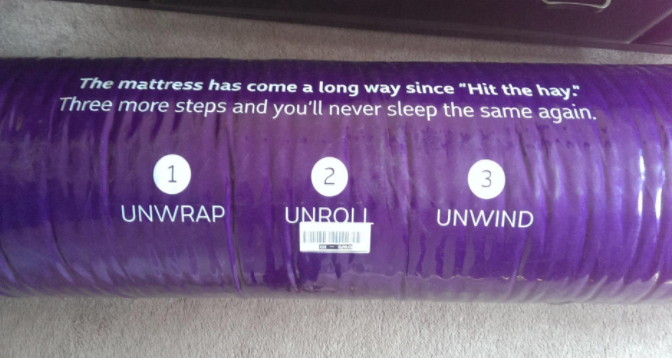 Many purple mattress users report reduced back pains after sleeping on it for a few weeks. The mattress is easy to handle, lift or move because it has no handles and it’s floppy. It is thinner than the average mattress, by 1.5 inches, which makes getting on and off the mattress a bit hard. Support close to the edge of the mattress is inadequate especially for large people making sitting and sleeping uncomfortable. Several people have even reported falling off the bed as a result of the inadequate support. A few users claim that the mattress gives off an odor when its new. The odor, however, doesn’t last long. A significant amount of heat retention is reported by several purple mattress users. Purple mattress is about an inch shorter than the standard mattress and tall people might be forced to partially hang their feet over the bed which is uncomfortable. The small size of the mattress prevents sheets from staying taunt thus creating a rumpled look. Purple mattress has been on the market for a short time and buying from a brand that isn’t well established is risky since the flaws that come with a new product are unlikely to have been worked on. Purple mattress has an owner satisfaction of about 79% which is higher than the average rate of all mattresses. Men satisfaction is higher compared to women’s mainly because men weigh more and are able to exert enough pressure on the mattress so that it conforms to their bodies properly. Women, on the other hand, seem to experience heat issues with this mattress. Purple mattress is cheaper than the average mattress but more expensive than mattresses similar to its dimensions and design. Summarily, purple mattress is a unique mattress with exceptional comfort, support and cooling. Its material and design ensures you get a good night sleep.